The Daniel in my head has issues. The Daniel on the page – not so much. I built this mind map to bridge the gap. A few weeks ago, I sent my critique partner the first several chapters of my manuscript that’s under revision (not to be confused with the one in first draft stage or the other one in discovery phase). I knew those pages had problems but I’d been staring at them too long. I didn’t know where to start. When I got my my CP’s notes, she had lots of great insights, the most important being that my hero, Daniel just wasn’t clicking. She had a few suggestions for improvement, and I immediately came up with some more. But I wanted a quick picture of what I know about Daniel and his character arc, and what steps he needs to take in his journey. Around this time, I’d been reading a lot about mind mapping for my ‘day job’, and in a flash of inspiration, decided to apply it to my ‘Daniel problem’, resulting in the lovely picture you see to the left. What the Heck Is Mind Mapping? 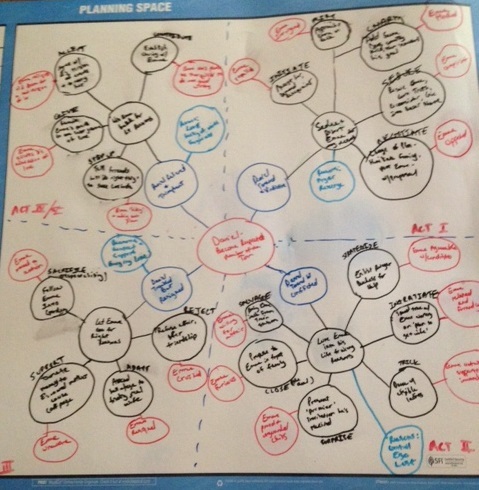 Mind mapping is a way to get information out of your brain and onto paper (or screen) in a graphical way. The term graphical is up for grabs. It’s what works for you. That might be pictures, text bubbles (which obviously work for me), or some combination of words and pictures. The important thing is to avoid creating a linear structure. No sentences, paragraphs, or lists. You can get a more in-depth definition of the concept here.